MANISTIQUE, MI--(Marketwire - May 1, 2008) - Mackinac Financial Corporation (NASDAQ: MFNC), the bank holding company for mBank (the "Bank") today announced first quarter 2008 income of $.139 million or $.04 per share compared to net income of $1.035 million, or $.30 per share for the first quarter of 2007. The results of operations for the first quarter of 2007 include the proceeds received, $470,000, in the settlement of a lawsuit against the Corporation's former accountants. Excluding the lawsuit settlement, the net income in the first quarter of 2007 amounted to $.565 million, or $.17 per share. Weighted average shares outstanding amounted to 3,428,695 in both periods. Operating income in the first quarter was impacted by net interest margin pressure. 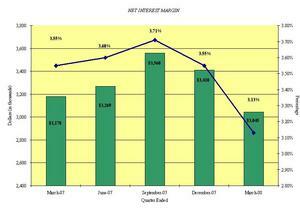 Net interest income declined from $3.178 million, 3.55%, in the first quarter of 2007 to $3.045 million, 3.13%, for the same period in 2008. This decline in margin was attributed to an asset sensitive balance sheet and a significant level of wholesale funding. Wholesale funding costs have not declined in line with overall market rates due to an increase in funding demand to address overall market liquidity. Paul Tobias, Chairman and Chief Executive Officer, commented, "The decline in our net interest margin does concern us and we are taking steps to mitigate the short-term impact of higher cost funding. We will initiate cost reduction efforts throughout the Corporation to offset the margin shortfall in 2008. As we progress through the year, a good portion of our liabilities will reprice, producing higher margins. In addition, we are reviewing all loan relationships as they come due and repricing renewals and new loans with a spread off of a base rate that provides acceptable returns to shareholders." Total assets of the Corporation at March 31, 2008, were $417.175 million, up 11.06% from the $375.644 million in total assets reported at March 31, 2007. 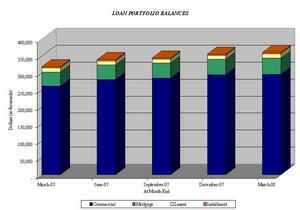 First quarter-end total assets were up 2.03% from the $408.880 million of total assets at year-end 2007. Total loans at March 31, 2008, were $360.056 million, a 13.08% increase from the $318.421 million at March 31, 2007. Total loans at the end of the first quarter of 2008 increased $4.977 million, or 1.40% from year-end 2007 total loans of $355.079 million. Tobias stated, "Loan growth in the first quarter was impacted by $4.4 million in paydowns; however, our first quarter new loan production was strong at $17.8 million, which should translate into solid growth in the near term as these loans fund. We continue to see loan demand; however, activity has slowed with economic uncertainty. We will be selective with loan growth opportunities in 2008 through stricter credit standards and enhanced pricing. We will also use extreme caution on renewals and extensions of existing loans and reevaluate these credits to determine if these relationships fit our current risk and pricing requirements." Total deposits of $326.047 million at March 31, 2008 were up 7.11% from deposits of $304.412 million on March 31, 2007. 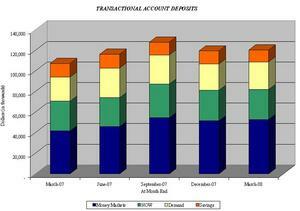 Deposits were up 1.63% from year-end 2007 deposits of $320.827 million. Deposit growth increases in the 2008 first quarter were due to increases in wholesale brokered deposits of $1.9 million and bank deposits of $3.3 million. Deposit balances increased by $21.6 million from March 2007 to March 2008. In October 2007, the Corporation sold a branch office with $9.3 million in deposits. Deposit growth from March 2007 to March 2008 after adjusting for this sale would total $30.9 million, with $22.2 million from wholesale deposits and $8.7 million representing growth in bank deposits. Mr. Tobias added, "The competition for deposit growth is intense. We are constantly evaluating our deposit products and market pricing to help stimulate growth. Early in 2008, we added a senior staff position that will focus on deposit growth opportunities in the Upper Peninsula and Northern Lower Peninsula. We continue to supplement our northern branch system by offering competitive rates, low fee and account cost structure, efficient internet banking, remote deposit capture, and courier services." Nonperforming assets at the end of the first quarter of 2008 totaled $4.518 million which was down $.716 million from 2007 year end balances. 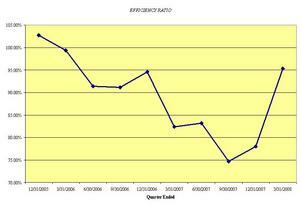 This first quarter decrease was due to the collection of an SBA guarantee on a nonperforming loan. Tobias, commenting on credit quality, stated, "We remain vigilant and believe that we have identified and properly reserved for known credit issues. However, as the economy continues to soften, we will work to minimize the impact that eroding collateral and ability to repay could have on our operating results." Shareholders' equity at March 31, 2008, totaled $39.633 million, or $11.56 per share, compared to $29.932 million, or $8.73 per share on March 31, 2007. Tobias concluded, "We expect 2008 to be a difficult year for our industry. Credit issues for many banks will become more severe as real estate values continue to fall. This will be accentuated in Michigan, given our troubled State economy. In comparison to our Midwest peers, the portfolio credit quality characteristics are strong; however, we know that we are not immune to continued market deterioration. This quarter's credit metrics did not require us to recognize a provision. Investors should anticipate that in future quarters loan loss provisions will be required if further market deterioration impacts our weaker credits. That being said, we are confident that we will weather this period of credit concern. We would invite our investors to examine our book value and take comfort in the value per share that has been created. We believe our book value is well protected by reserves and will continue to grow in 2008 and beyond." Mackinac Financial Corporation is a registered bank holding company formed under the Bank Holding Company Act of 1956 with assets in excess of $400 million and whose common stock is traded on the NASDAQ stock market as "MFNC." The principal subsidiary of the Corporation is mBank. Headquartered in Manistique, Michigan, mBank has 12 branch locations; eight in the Upper Peninsula, three in the Northern Lower Peninsula and one in Oakland County, Michigan. The Company's banking services include commercial lending and treasury management products and services geared toward small to mid-sized businesses, as well as a full array of personal and business deposit products and consumer loans.